This traditional reluctance should be a thing of the past. In today’s tough retail environment, networking and sharing are welcomed by more and more operators as a competitive advantage. The more we know, the more likely we are to make better decisions. So there’s no problem with owning a retail store that sells $850,000 a year, unless and until you dig deeper to see what the other metrics show about today’s operation and what sales have been in the past! Current sales volume is just a number documenting a step on the ladder that many other companies have occupied at some point in their development. Similarly, there’s nothing fabulous about “doing $25 million,” unless and until you look under the hood. There are many famous retail brand names which once boasted billions in sales, but are no longer around. Sales volume is just a marker of size – a place on the graph or ladder to higher volumes. Sales on its own has little merit with few, if any, lessons to be learned on its own, except maybe local bragging rights. But if that’s all there is to work with I can at least look at the growth (or lack of) in sales over the years and ask the question, “Are the sales going up as least as quickly as the rise in the costs of doing business?” That’s our first Hmmmm…. As we will see in future blogs, that sales volume number is crucial when comparing margin dollars earned from those sales, or labor costs to drive that volume and so on. In fact sales volume is the denominator for several of our standards and comparisons on the retail dashboard from Gross Margin dollars to Labor Productivity. And you want to be able to see improvement in those numbers for your own company over time. (But we know you still like to compare). One of the features of The 5 Numbers Project within Your MarketMetrics is that it will be filterable by business size or geographic region … so you can compare yourself to “others like you” more readily. When there are at LEAST 5 businesses in each category, layered filtering (size AND region) can be ‘turned on’ – our primary objective is maintaining anonymity. For now though, the first of our five numbers is a really just a marker, which on its own and without “lifting the lid” on the other performance metrics, has limited value. But it’s an essential starting point to our project – oh and useful for local bragging rights too! So, are you all “south of $500 million” out there? We are! Next week, we’ll dive into learning more about number 2 in T5NP: Customer Count/Register Rings/Tickets – stay tuned! If you’ve heard me speak recently, you already know we are seeing a serious polarization in the independent or “local” garden retail channel. It’s similar to what happened in the local hardware channel in the 1990s, when around 50,000 retailers shrunk to around 18,000 now. But those survivors are now thrivers! It’s very clear from the last few years that in the family-owned, privately-held garden retail channel, the good are getting better. They are winning market share (often in the same town) from the less good and this year’s data from our two network groups and clients validates that observation. The better-managed companies are making more margin dollars and, for those in the know, more “Gap” dollars, even if the sales “topline” looks similar. So as you tour these stores, look beyond the photo-shoot displays and clean bathrooms. Ask the questions that really matter: Where did they get their inspiration and ideas? How did they know it would pay off? Who do they seek counsel from and make critical decisions? I am guessing you’ll find that your hosts were early adopters and networkers. Although ANLA’s Management Clinic sadly ended six years ago now, I’ll bet your hosts were regulars there, networking and learning from 7am to 1am. I suspect they were early adopters of capital improvements such as state of the art greenhouses, benching and signage. They were probably early adopters of network groups, training programs and, dare I say, they might even be among the 730 people who went on one of our 16 England Garden Center tours. I have spent many hours wondering what makes a winner in this channel. It starts with a clear vison based on months or years of collecting the data/evidence of others’ successes and failures. It continues with a clear feasibility plan which is pre-loaded with strategies for expected (and unexpected) challenges. They have a strong Plan B, an ability to measure and monitor, and an openness and a preparation for change mid-dream if necessary. They are also ready to make some unpopular personnel and/or family decisions (try firing your sister or putting your Mom on a 90 day write up…). These winners invest more than most others are comfortable spending. They accept risk that stops others sleeping at night and they hire people who know more than they do. Two of our clients borrowed loans equal to their annual sales in the previous year (those were the days when banks were partners!) – while in their twenties…. Another bought out their parents but only if they agreed to move 100 miles away – think about that one! I know owners who invested early in POS while others shunned it because of their own dislike of computers. We have a client who 12 years ago spent over $16,000 on a sign machine while other more established and larger nurseries scribbled on the back of an old J&P sign. We have clients who travel thousands of miles to see stores not in the garden business, just to keep up with general retail. They all have a passion to learn and keep moving forward, to constantly challenge and “change it up”. They simply don’t say (or tolerate their team saying), “That’s good enough”. After so many years in the trenches I could go on (yes, I know, I DO go on…) but the key takeaway from working with some of the best in the business is that there are clear, consistent reasons for their success: vision, focus, risk and the humility to constantly learn and change. PS: On that timely tour topic, some of you readers may be touring one of our favorite clients this week in Utah – Sun River Gardens (https://sunrivergardens.com/, pictured in header). Take a close look and ask those deeper questions to Scott and Tanya: they are rightfully proud of all that they have accomplished, but it didn’t happen overnight … and it wasn’t easy! Kudos to them, and to ALL of you – the garden centers who take the time and expense to tour whoever is moving the needle, so you can move it yourselves. That’s how an industry moves forward. Right now most owners and managers in the retail garden business are in “can we catch up with budget?” mode after a late, cold spring season and are probably not worrying too much about demographic trends. So mark this as a “should look at this again after Memorial Day” doc and circle back when you can raise your head above the trench. Talking of military analogies the cavalry, in the form of the under 35 year old householder, is coming over the hill to save the garden industry – just in time, as female Boomers continue to disengage. 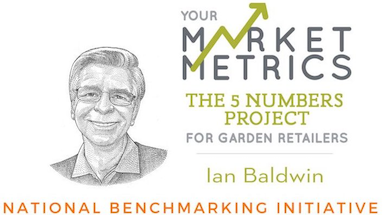 As an Analyst and Commentator for the 2018 National Gardening Survey (NGS) (www.gardenresearch.com) I have the opportunity to look at the data regarding the American consumer’s participation in and spending on “gardening”. First let me say that we (i.e. the NGS team) do not fixate on a single year’s data, even though both gardening spend and retail sales hit all-time highs in 2017 – which would be very tempting headlines. But we do look very closely at consumer spending trends over 6 year periods and even more crucially at the participation data. People remember what they did last year more accurately than what they spent last year. While participation in gardening stayed flat among households of those over 55 years of age, it continued to rise in the households of under 35s. They are not yet spending the same amount of money as their older siblings and parents but they are now seriously engaged in more than just houseplants and veggies. Under 35s have caught up with older groups on participation rates in what were until recently bastions of “settling down” such as DIY Landscaping, Container Gardening (no hole-digging for them) and purchasing tools or equipment. I think we can now say that the under 35s are “all in”. Nestled in the 250+ pages of NGS data, something caught my eye. Twenty years ago, the NGS showed that the biggest consumers of “Gardening Information” were females over 55 years old. The 2018 NGS shows that same data point to be the under 35s and male…. Hmmm. Furthermore, they are buying information online the way people bought magazines 20 years ago. Although we are always cautious about one year’s results, millions of households say they acquired a gardening app last year alone! So, what are you doing to meet, welcome, educate and assure younger householders’ success in their digital space, so they get it right the first time? That would seem the best way to win their loyalty. To them, first-time success is an essential part of the ‘shopping experience’ about which we are now hearing so many clichés. Please join in the comments, let us know how you are tackling this huge opportunity – when you can raise your head above the parapet! !